For a limited time, any customer who purchases qualifying XFX AMD RX Vega, RX 590, RX 580, or RX 570 graphics card at Best Buy will receive Free Games! Valid on purchases from 11/15/18 until April 6 2019 or while quantities last. Must purchase card from Best Buy. Best Buy purchases will be provided game code through email from Best Buy . Please confirm product eligibility and participation upon purchase. Washington D.C. is on the brink of collapse. Lawlessness and instability threaten our society, and rumors of a coup in the capitol are only amplifying the chaos. All active Division agents are desperately needed to save the city before it's too late. Enter the world of extreme gaming with Radeon RX Vega graphics & Radeon™ FreeSync technology. Experience silky-smooth gameplay at high resolutions, peak framerates, maximum settings, and with cutting edge features carrying you into the future. Radeon™ RX Vega. Defy Convention. Experience the exceptional visuals of top PC games with this VR-ready XFX Radeon RX Fatboy graphics card. Its 8GB of 256-bit GDDR5 memory handles the demands of complex gaming and 4K streaming, and the 1600MHz overclocking capability provides an extra performance boost. This XFX Radeon RX Fatboy graphics card stays cool and efficient with an increased heat sink surface area. 50% addition cooling to RX 580 models. Industry-leading innovation and powerful performance enables the Radeon™ RX 580 to deliver premium experiences on high-end VR games, entertainment, and applications. Get ready for the future of gaming at 1440p with the Radeon™ RX 580 graphics card. 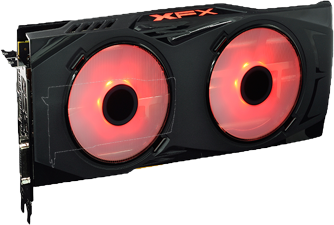 Comes loaded with XFX's proprietary LED Hard Swap Fans. 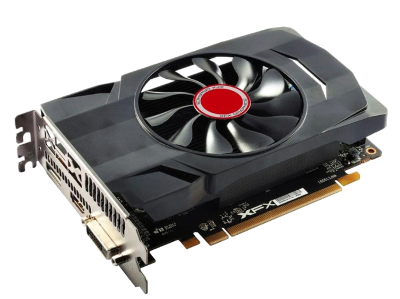 Match intense gaming with seamless visuals by using this XFX AMD Radeon RX graphics card. Its FreeSync 2 technology renders fast-action images without lag, and it optimizes speed performance thanks to its XFX True Clock technology. Experience smoother gaming with this Radeon graphics card. Its 4GB of GDDR5 RAM provides high-performance operations in image-intensive video adventures and stunning color reproduction for a more realistic appearance. 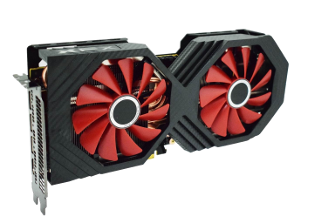 This Radeon graphics card has a 128-bit memory interface for accelerated frame rates and includes HDMI 4K60 support for high-quality video playback. 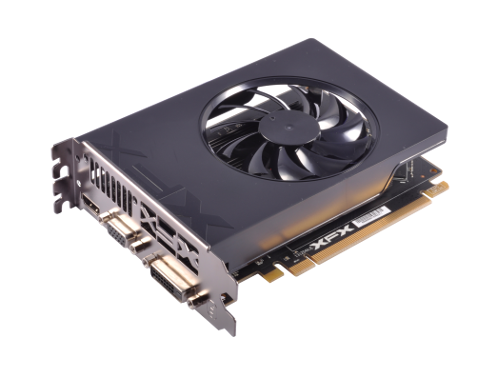 Power your gaming experience with this XFX Radeon graphics card. Its 4GB of RAM reduces lag time for smoother images, and it has a 1203MHz GPU clock speed to maximize performance. 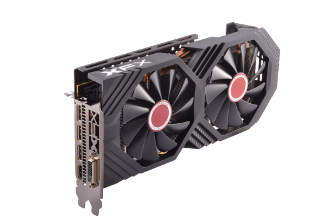 This XFX Radeon graphics card is equipped with the Radeon Chill feature that adjusts the frame rate to the intensity of your gameplay, conserving power. The XFX R7 240 is designed with the budget conscious in mind. With 4k @30hz support through HDMI, AMD TrueAudio technology, and BluRay Support this card excels at High Def. Can also run 2 independent displays out of the 3 available video ports at the same time. DirectX 11 and 4gb of DDR3 memory allows for light gaming as well. Designed for everyday use. 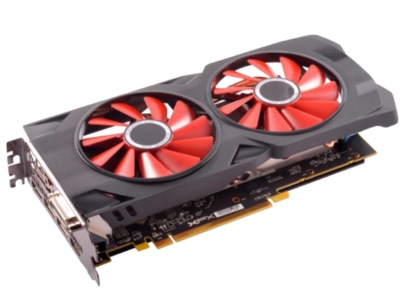 The R5 220 graphics card is an easy upgrade for any that will allow you to run 2 monitors at the same time, play high definition video with audio out of the HDMI port, and make day to day graphics work a breeze. Codes are emailed to you by Best Buy. *Offer available through participating retailers only. Following purchase, Coupon Code must be redeemed by April 6, 2019, after which coupon is void. Residency and additional limitations apply. For full Terms & Conditions, visit www.amdrewards.com. Campaign period begins November 15, 2018 and ends April 6, 2019 or when supply of Coupon Codes is exhausted, whichever occurs first. Eligible AMD Product must be purchased during Campaign Period. Offer void where prohibited. These games are not rated. May contain content inappropriate for children. Please consult with ESRB.org, PEGI.info, or your regional game ratings organization. and the Ubisoft logo are registered or unregistered trademarks of Ubisoft Entertainment in the US and/or other countries. Resident Evil™ 2 and Devil May Cry™ 5 images and logos © Capcom Co, Ltd. All rights reserved.